Good health is about where we live and how we go about our days as much as it is about going to doctors and picking up prescriptions. In 2018, through a generous grant from the Robert Wood Johnson Foundation, the Community Foundation for Greater Atlanta created the Georgia Healthy Cities project. The Georgia Healthy Cities project exists to help communities better understand how their neighborhoods impact their health—and what local-level changes can help improve their health outcomes. Our mission is to encourage and support local involvement in public health planning, and we're doing so by bringing together data and resources to create toolkits that communities and policymakers can use to effectively advocate for change. Our Approach: Create Health and Wellness Toolkits to help break the health services silo and facilitate cooperation across sectors to tackle the upstream factors impacting health. Several decades ago, Georgia made the decision that all health and human services would be organized at the county level. For many years, public health, child and older adult services, mental and behavioral health services have all been located within county governments, multi-county boards of health or multi-county health coalitions. While across Georgia there are effective city and county partnerships, for the most part Georgia’s municipalities have “stayed out of the health business”. With so many organizations and institutions adopting a culture of health and integrating a social determinants framework into their work, it is no longer feasible to affect health change without engagement at the city level. Cities impact public works, infrastructure, housing, transportation and economic development, all of which are essential to advancing health for all. The following diagram outlines the social determinants of health which impact our health and wellness. health and community development sectors. Our approach to improving the social determinants of health includes analyzing the 500 Cities data to identify the most pressing health challenges in Georgia's cities; this offers a powerful opportunity to enlist city leaders and leverage city resources to improving our communities. The timing is critical because as Georgia invests more in improving health, those investments can either follow a traditional path—hospitals and clinics – or they can reinforce a culture of health, by investing not just in healthcare, but in communities and the upstream issues that can improve health over a generation. When people are not healthy, they are not able to be productive at work, in school, at home, and in their community. Driving healthcare conversations at the local level between community health advocates, business leaders and government agencies. Strengthening community partnerships centered around data driven decision making. Having open community conversations about health equity and policy interventions. Primary data source: The 500 Cities dataset, a collaboration between the Center for Disease Control (CDC), Robert Wood Johnson Foundation, and the CDC Foundation, details city- and census tract-level small area estimates for chronic disease risk factors, health outcomes, and clinical preventive service use for the largest 500 cities in the United States. We used the 500 Cities datasets to create indicator-specific and composite national and state ordinal rankings to identify where our target cities fare across the other largest 500 Cities. Visualization Tools: We built a suite of data visualization tools to help the community and local governments better understand the public health indicators that affect the quality of life in each community. The visualization tools include interactive and responsive maps, dashboard and tables so community members can explore factors that may impact short- and long-term health outcomes. The visualization tools allow the community to tell their health story. Community Conversations: We conducted multiple community workshops in each of the target cites. Partnership Development: In each city, we held initial meetings to identify ourselves, the project goals and identify community health advocate partners. Community Workshops: We followed up the partnership development meetings by holding community workshops in each city. These meetings included health equity discussions, identification of the highest risk diseases and a hands-on interactive learning of the visualization tools. Learn more about our community workshops' findings. 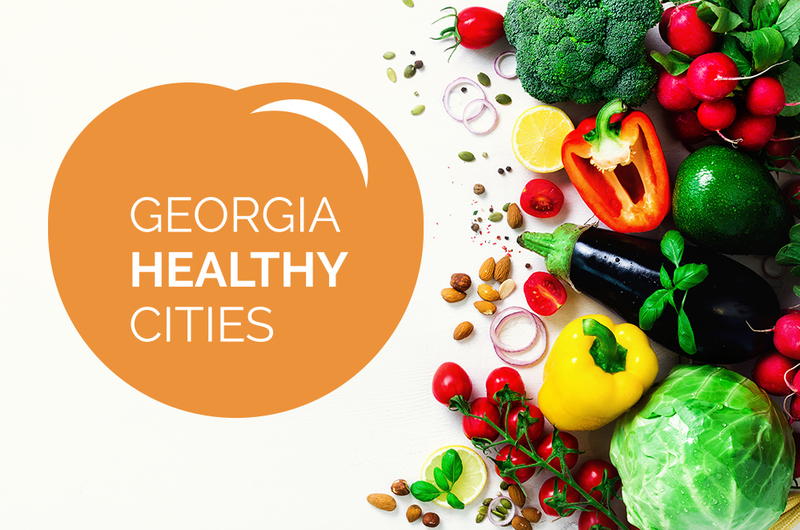 Over an eight month period, August 2018 through March 2019, Georgia Healthy Cities conducted online surveys to gauge residents, in our target cities, on the social determinants of health within their life and in their communities. The survey questions focused on doctor care, doctor visits, neighbor connections, neighborhood safety and walkability, transportation use to medical facilities, access to grocery stores, satisfaction with existing neighborhood services and potential for new services. We used two survey instruments: an interactive community engagement mapping survey tool which allowed the respondents to place geographic reference points to survey questions and a traditional online survey tool with a structured questionnaire.